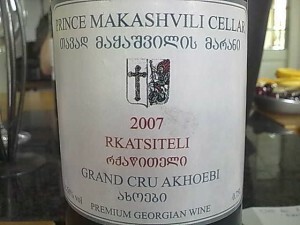 This grapes for this wine come from the Grand Cru vineyards of Akhoebi, in the village of Kardanakhi in the low hills of the Kakheti region. 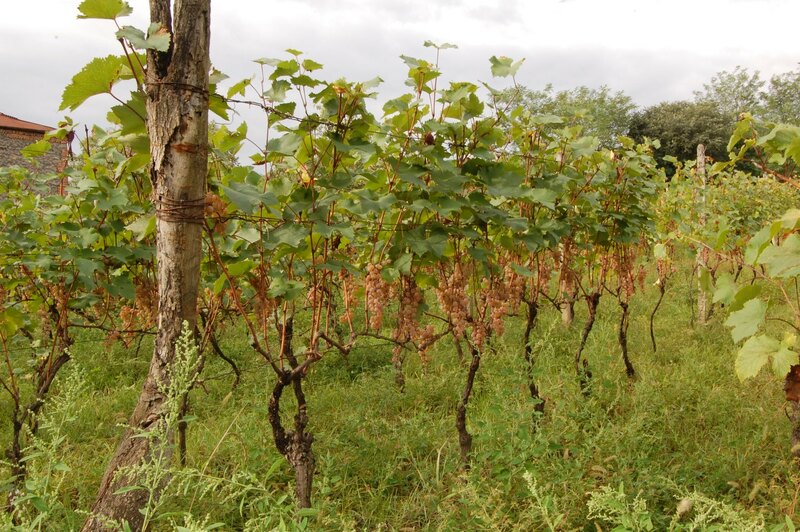 The vineyard covers 1.9 HA and are farmed biodynamically and harvested by hand. The soil is black and carbonate-rich. 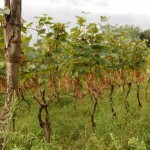 The vines are widely spaced at approximately 2500 plants/HA, trained in a double Guyot pattern. 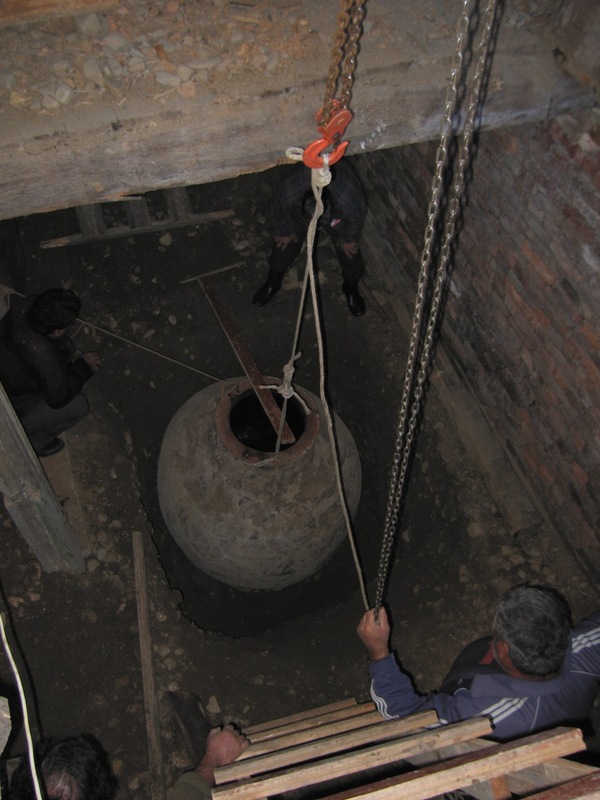 The vineyard is planted with approximately 90% Rkatsiteli, 4% Mtsvane, 4%Khikhvi and a red variety called Saperavi, all on original (non-American) root stock. Harvest is done by hand, the grapes pressed softly. 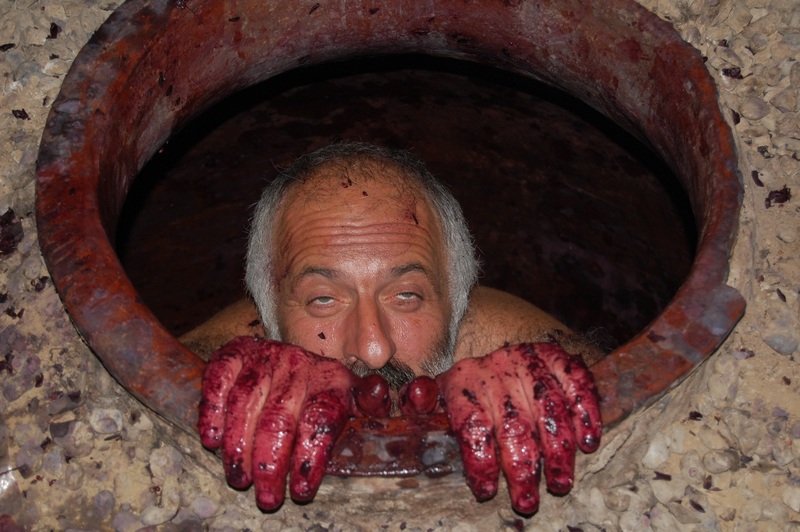 The wine is spontaneously fermented and macerated for 6 months with skins in Qvevri. 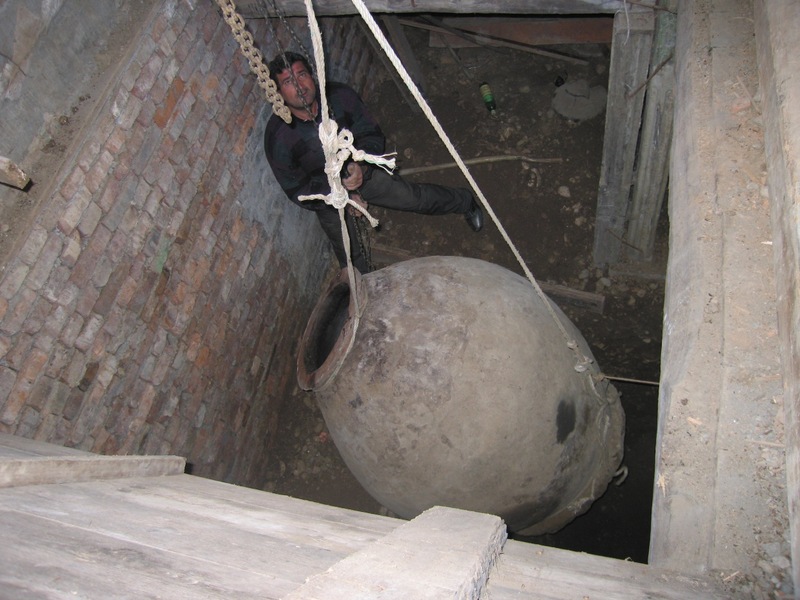 After skin and stalk separation, the resulting wine is stored in smaller Qvevri for a further 12 months. Bottled without filtration. 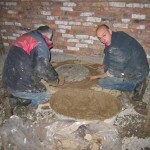 In 2007 approximately 20hl/ha was produced, or 1200 bottles. Appearance: Apricot-orange hued with golden edges. Nose: Herbs and spices (lavender & rosemary) layered on top of yellow fruit. Sweet arctic cloud berries with strawberry (yes, strawberry) notes. Palate: Great focused fruit. Apricots mostly. Medium tannins with medium level acidity. 30+ second finish. 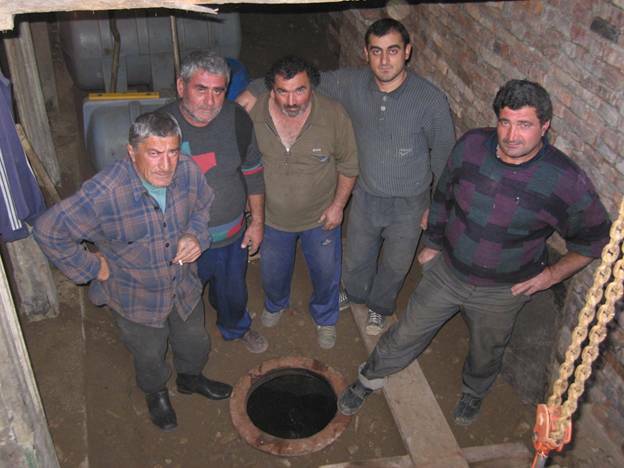 Bone dry. 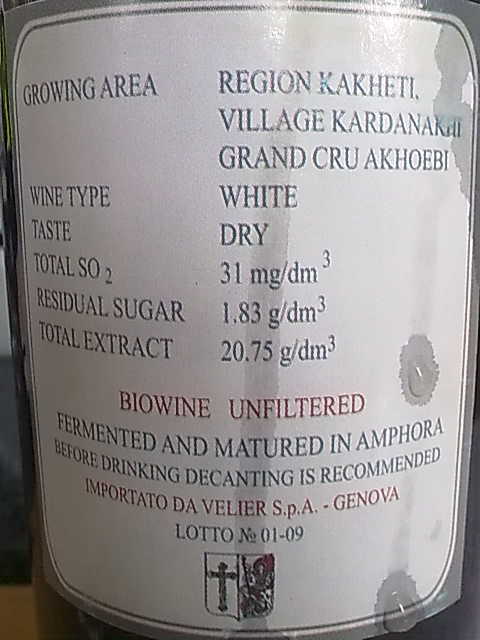 The Grand Cru Akhoebi was my favorite of the three I wines tasted. 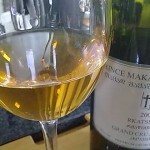 This grapes for this wine come from the Grand Cru vineyards of Tsarapi, in the village of Kardanakhi. 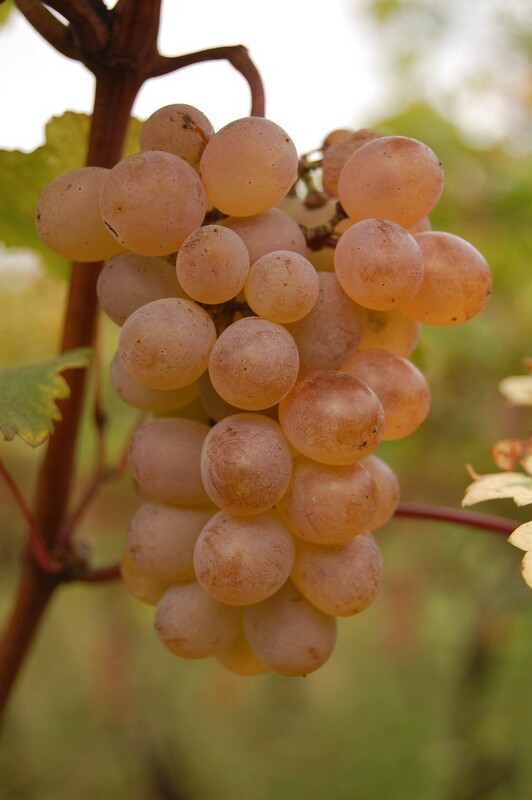 The vineyards cover 1.25 HA and are farmed biodynamically and harvested by hand. 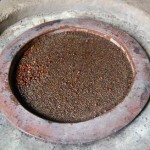 The wine is spontaneously fermented and macerated for 6 months in Qvevri, then stored in the Qvevri for a further 12 months. 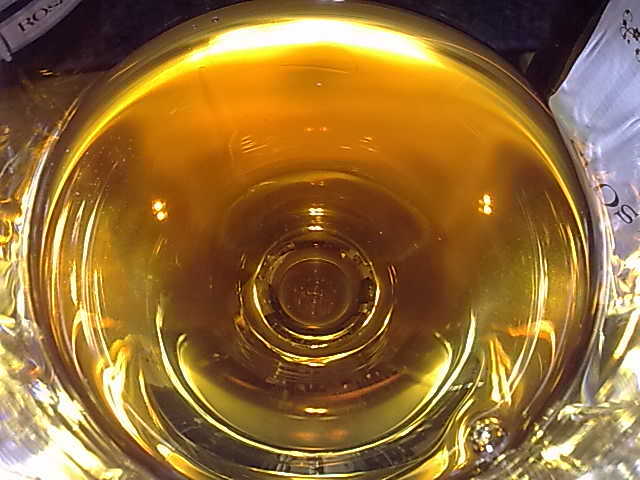 Bottled without filtration, and on this particular bottle, this was quite obvious. 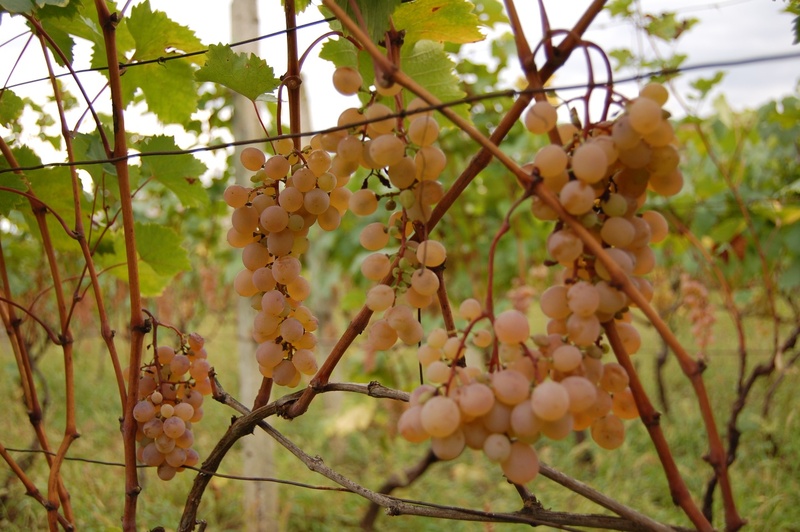 Approximately 20hl/ha is produced, or about 1200 bottles. 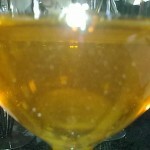 Nose: Sponty aromas with apricots, with less herbs and spices than the Akhoebi Grand Cru. My favorite on the nose of the three wines because it had that perfect balance between fruit and wild aromas with just enough minerals to give the wine a serious edge. 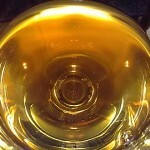 Palate: More vinous than the Akhoebi – thick, structured and concentrated. Quite a serious wine and very mineral. Medium + tannins and acidity with a long finish. Bone dry, elegant fruit. This wine wanted desperately to be my favorite, but it came in second behind the Akhoebi. 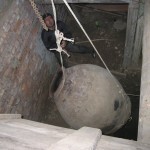 However, with a few years more of cellaring, this may show even better than the Akhoebi. 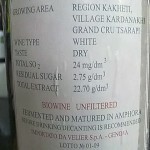 My overall impressions were that these three Georgian wines I tasted were of top quality and quite serious food wines. 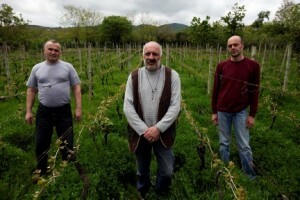 I would have no problem drinking them alongside my Friulian & Slovenian favorites. 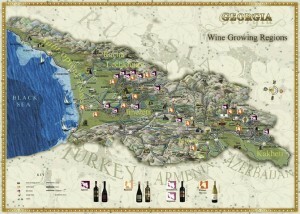 Now, back to the future (today) and the wines of Georgia, all hailing from the Kakheti region located in Eastern Georgia, the driest of the 3 regions. It is the largest wine region in Georgia spanning over 11,000 square kilometers. 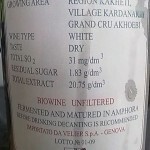 All three wines were (mostly) of the same grape variety, Rkatsiteli (or Rkatziteli – pronounced rkah-tsee-tely, and directly translated means “red vine”). 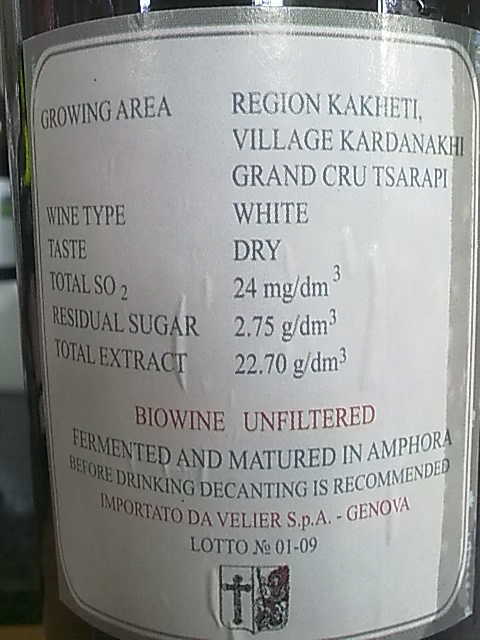 The only Georgian wine experience I have had before today, was tasting some half-sweet (non-representative) red wine that was poured from a decorated clay bottle, and let’s just say it wasn’t a wine to remember. In fact, I only remember the bottle to this day. These three wines were not at all what I had anticipated. 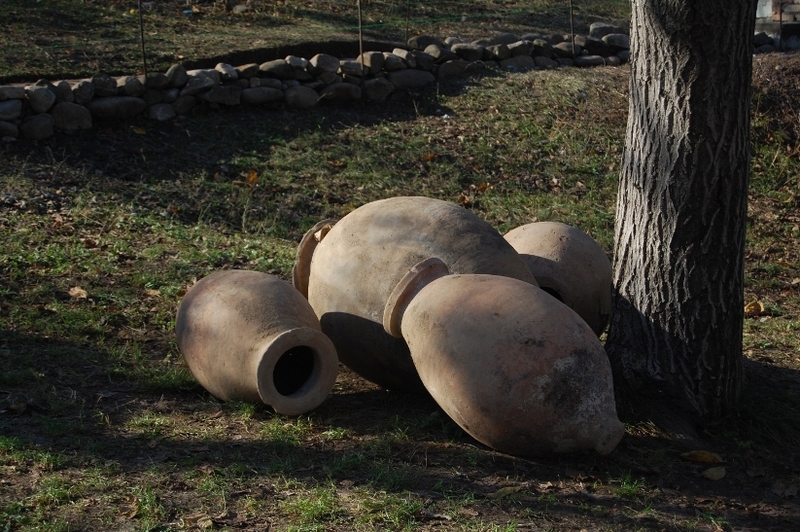 They were aromatic, complex, fresh and tannic wines that would do well with food. 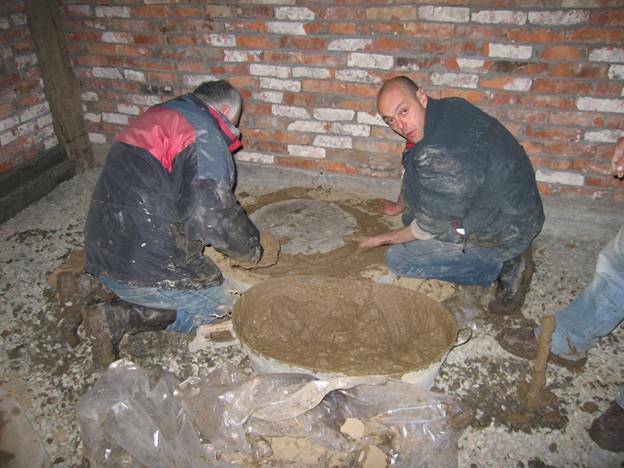 This project started about 4 years ago when a group of Italian wine and spirit merchants (Luca & Paolo Gargano) from Genova purchased a 1.8ha vineyard in the village of Mararo. With the help of Jean Jacques, a friend of Nicolas Joly, and a local farmer named Nodar Shinjiashvili who was cultivating old varieties of cereals biodynamically, Clos des Amandiers was born. 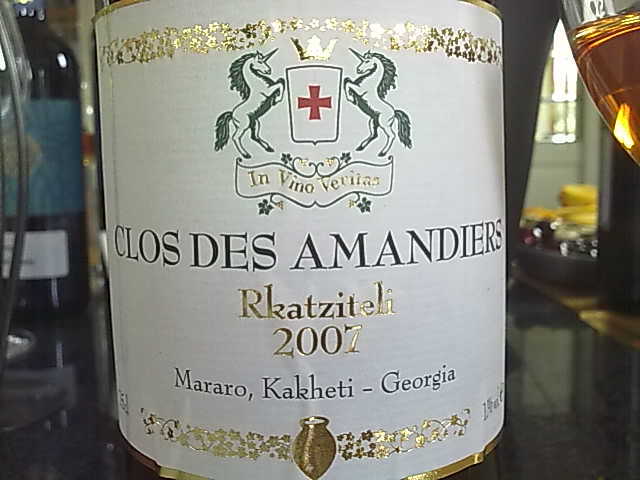 In 2007 they released their first vintage, the first wine in my tasting. The vines for this wine share the space with almond trees and are cultivated biodynamically. 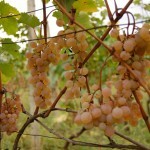 Harvest occurred in October, the grapes subsequently softly pressed. 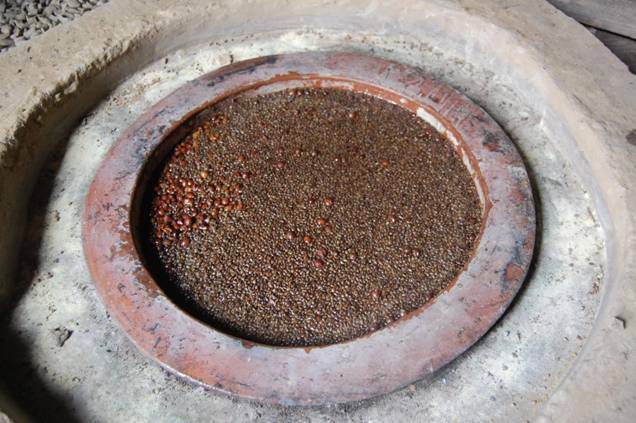 Fermentation occurred spontaneously with indigenous yeasts in old Qvevri without temperature control. 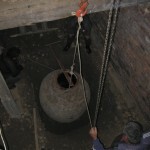 Maceration lasted for six months in these Qvevri then transferred to smaller, non-buried Qvevri for 12 months maturation. 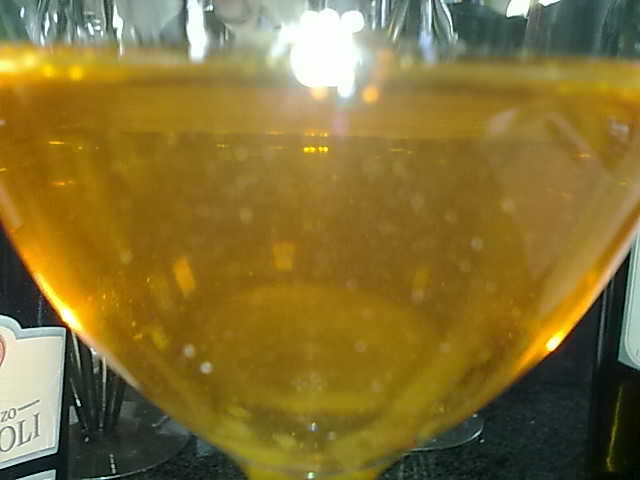 The wine was then bottled without filtration and left to age in the bottle. Nose: Wow, intense. 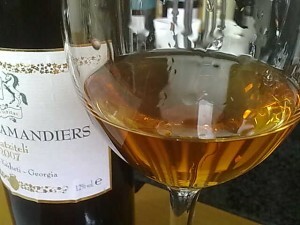 Quite a sponty and wild nose of dried peaches, raw almonds, marmalade and yellow plums. Hints of jasmine and lavender emerge after about an hour. Palate: A delicate and elegant entry. Red apples (yes, red) and yellow apples. Medium ++ tannins, medium + acidity (tangy). I found more fruit on the nose then I did on the palate. The wine had a 30 second+ finish with dominating tannins and toast. I feel that this wine would be very suitable to food. Especially dishes with high contrasting flavors and moderately spicy food (because of the fruity aromas in the wine). A dish specifically recommended to me would be yogurt-marinated baked mutton (meat of mature sheep). My experience with orange wines is that they merry quite well with food in general, from your sweeter, more aromatic dishes, to meat dishes and finally with cheese.